There are some trees in my deeply sloped back yard—really more forest than yard—which have beat all the others in donning their fall color. They are over-achievers demanding attention and have their moment of glory first. These trees are scrawny compared to those around them—the hulking tulip poplar with its truncated leaves the size of my face or the myriad of oaks and maples—all taking a more leisurely pace into their season of rest. They stand in a sort of drunken line where my yard’s slope eases its steep decent, cutting across the width of my property, making a royal-colored curtain that waves to me in the breeze. Every morning my children sit at the breakfast table drowsily eating their cereal and peanut buttered bagels, staring out the big picture window; too tired to be tidy, but awake enough to notice the brightly colored trees. It’s true. The tree’s leaves have turned such a brilliant purple, it looks like Jack’s giant swooped his fist down from his castle on the clouds and punched our trees, leaving some bright plum-colored shiners amongst our otherwise solid green backyard façade. I became so curious about these trees, I had to figure out their species. No small task for a girl who grew up in the Midwest among corn and bean fields—not trees; despite having a forest ranger-trained father who continually and patiently pointed out tree species on every family state-park vacation. Sadly, bark and branch pattern identification never did stick with me, so knowing where to even begin looking in my newly purchased field guide took extra effort. I did it, though. I figured it out. 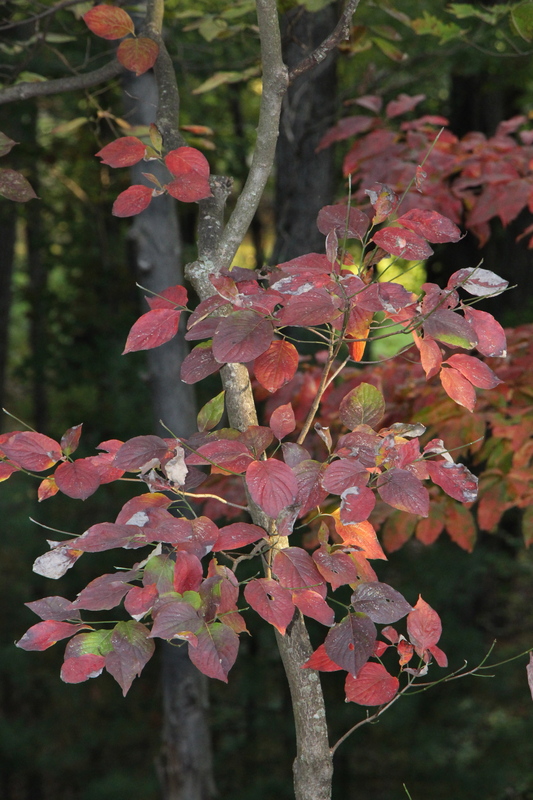 Our purple-colored trees are none other than Virginia’s state tree—the flowering dogwood (confession: I may be a tiny bit proud of my tree-identification accomplishment). Now all I see is flowering dogwood trees—mostly in people’s yards as a purposeful part of their landscape—unlike my own gangly, awkwardly shaped, sparsely clothed specimens growing wild among their peers. At first, the comparison reminded me of one of my favorite parables: The Parable of the Sower. I thought about how the seeds landed on different types of soil and in different types of places, and the effect of these on the seed’s development. I guess one could say my flowering dogwoods were sown in a poor place to have come up so wonky and wild; unlike their neatly manicured and fully branched counter-parts dotting many of my neighbors’ front yards. But, I like my skinny dogwoods. 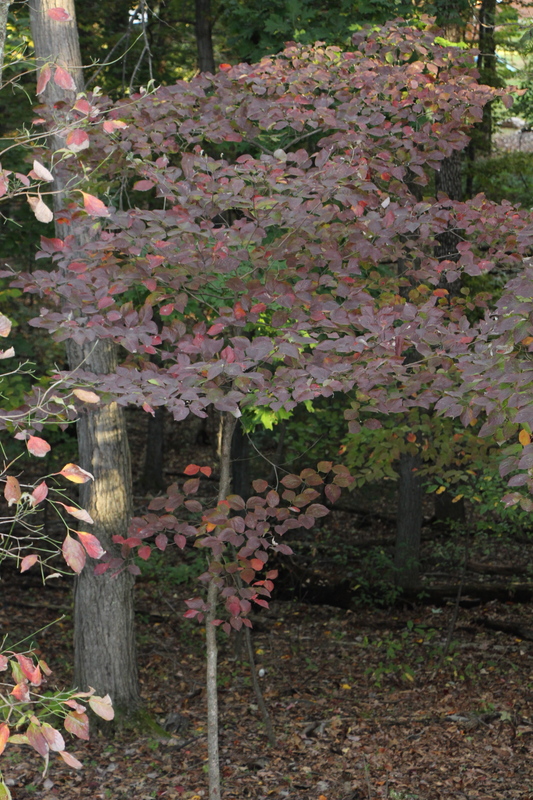 Their leaves are a deeper plum and more royal looking than my neighbors’ dogwoods. And, I like their shape better. I like that they branch out funny—one looks like a hand with it’s fingers reaching for the tree next to it, its leaves cascading out full and layered like a Virginian belle’s gown from the antebellum South. Another stands tall and straight, determined to break the forest’s ceiling and find sun. I like that I can see the shape of their branches, their knots and the funny crooks they make where new branches shoot off the old. My flowering dogwoods remind of me wild azaleas. Where I lived in North Carolina, it seemed nearly a sin to not have azalea bushes planted somewhere among one’s landscape. Goodness knows why, they aren’t the easiest things to grow and keep healthy, and other than the two weeks a year they are in bloom, they make landscapes look scratchy. But, when found in the wild, the azalea is striking amongst its forest friends. More straggly and not as bushy as the suburban hybrid, the wild azalea’s leaves present bold and strong, and their flower—oh my! Whatever color a neighborhood azalea can be, a wild azalea can be that color better. Maybe the Parable of the Sower isn’t the right association, then. Unlike the crop seeds dropped carelessly by the sower (who—in this farm girl’s opinion–isn’t very careful with the gift of seed he’d been given) my dogwood trees were planted by no human care or error, either one. Rather they were planted by nature’s whimsy, which is really to say, by God’s design. “…let the field exult, and everything in it! How did He know a farm girl from the prairie, with not a lot of head knowledge but just enough heart, would someday come to own a small plot of forest in Southwest Virginia? And how did He think to be so creative as to give that girl a father with a love of trees and forest; then give that Midwestern farm family just enough resources for the farmer to take them on vacations amongst the trees, where he—without being so purposeful, but rather just living out of his own passions–instilled a love of the forests and enough curiosity into his daughter, driving her to discover just what trees grow in her own backyard forest? And finally, how did He know that through identifying trees and drawing nature around her, she would find peace and contentment amid the chaos and busyness that seems to define much of her life these days? Just last Friday, your forester/farmer father took your younger sister, her husband, one year old and me on a hike/walk in a state forest in Missouri, and yes he did. He is still true to form. He stopped a few times to talk about the trees, both tall and scrub, dead and alive, as well as the cacti growing from the dry rocky ground. He walked up and down steep hills, never tripping or being unsteady. He was comfortable, and loved that we were there. Just as he loved that you were there as a child. I love this post.